Thailand went home with the most medals tallying up a total medal percentage of 80% of their athletes! Chiropractic services were once again offered during this five day event. Many athletes were encouraged to come in for their adjustments before their bouts to bring them to their optimal physical level. A combination of IASTM, soft tissue release, Dynamic Taping, and chiropractic adjustments were all utilized to bring the competitors to the top of their game. The FICS team, composed of Miguel Camara(Philippines) and Yoshi Hojo (Japan) also encouraged coaches, trainers, referees, and staff to come in for their chiropractic treatments. Aside from treating the athletes, the team also wanted to help educate others about what chiropractic is and how we can help through different sports. Many athletes ranging from different countries came in to get treated. Among them, 3 champions came in to get regularly adjusted before their fights. All athletes were ecstatic about our presence and are already looking forward to the next major event that we can participate in. 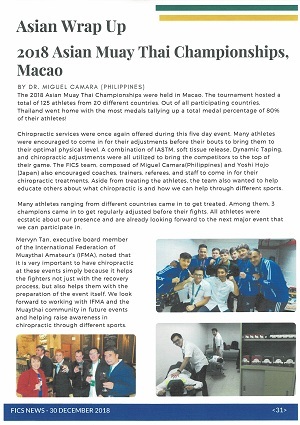 Mervyn Tan, executive board member of the International Federation of Muaythai Amateur's (IFMA), noted that it is very important to have chiropractic at these events simply because it helps the fighters not just with the recovery process, but also helps them with the preparation of the event itself. We look forward to working with IFMA and the Muaythai community in future events and helping raise awareness in chiropractic through different sports. Please inform us application of the special offer when you make a reservation. If you need chiropractic care, I have some good news for you.I need help to improve my English skills as a chiropractor for the Tokyo 2020 Olympic Games. 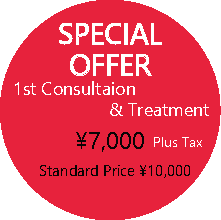 You can get 50% OFF your first consultation and treatment so that I can gain experience using English in my job. I came to Dr. Hojo's office after a doctor told me that there was nothing I could do about the pain I was experiencing in my shoulder and arm. I found his practice online and read other people's testimonials and decided to give it a try. I'm glad I did. Dr. Hojo is very patient and kind and extremely good at what he does. His English is fantastic, and he explains along the way exactly what he is doing and why. Additionally, he let me know how long it would take to heal and what I could do to help the process. In a very short period, I was pain free and feeling great and because of this I highly recommend Dr. Hojo's services. I have been seeing Dr. Hojo for a while now due to shoulder and neck pain. Dr. Hojo has really helped me with my problems and pain. His English is perfect, which makes communication very easy. He is very good at explaining his treatment and is always prepared to answer any questions you might have. Dr. Hojo is very friendly and helpful, yet professional. I highly recommend his services to anyone. I have been a client of Dr. Hojo for nearly three months and in that short time I have experienced a dramatic decrease in lower back pain and the frequency of head aches and neck aches. Dr. Hojo is always incredibly thorough, providing friendly and professional support. He has also been very helpful at recommending simple exercises to do at home and at work, which have really helped to maintain the progress achieved in his sessions. He takes the time to explain why certain issues occur and gets to the root of the problem, rather than offering a quick, superficial fix. His great English means that he is able to explain exactly why he has chosen a particular treatment and there is never any ambiguity in his explanations or answers to questions. I would highly recommend Dr. Hojo's services. I have been seeing Dr Hojo for a while now and what makes me go back is the holistic approach he takes to the treatment he performs. It isn't just a quick crack and see you later, as I have had from many other chiropractors in different countries. He is gentle and thorough and it is a breeze to communicate in English with him allowing you to explain your problems. I have felt a marked improvement in my movement after a few visits. He not only works on your bones but also the muscles around them which is often a blessing in disguise and gives you instant relief. 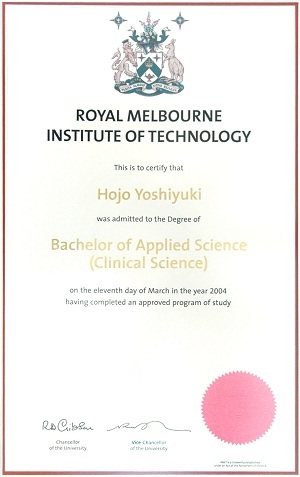 I highly recommend Dr Hojo's practice. I have been a client of Dr. Hojo for a month and with such a short period of treatment I am grateful that I am relieved from my back pain and sciatica leg pain. I highly recommend him for his top notch skill on chiropractic care plus they are very friendly and easy to communicate with in English. As I'm a foreigner it is difficult to find a doctor here in Japan who can understand my concerns for my well being. Dr. Hojo is recommendable for English speakers and he will explain to you briefly how to correct your posture and give some exercise tips to become pain free individual. 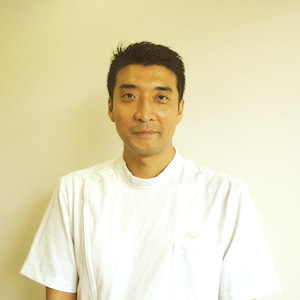 No need surgery as Dr. Hojo from Ichikawa Japan is here to help you. I had a reoccurrence of an old disk herniation resulting in severe back pain which also caused some shoulder/neck discomfort.This appeared due to the seating on the long flight from the USA to Japan.The issue made it hard to sleep or walk and no position gave adequate relief.After a few treatments from Dr. Hojo, the spine realignment was successful enough to resolve the pain and allow normal movement again.In addition, my Japanese is non-existent so the English skills of Dr. Hojo were very important to be able to communicate the issue adequately and to discuss treatment options. 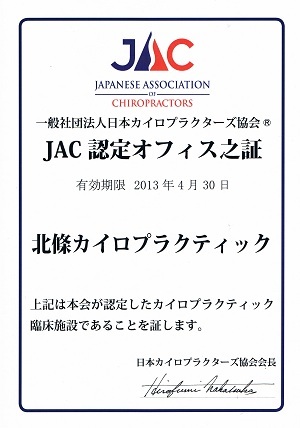 I would recommend Dr. Hojo to all English (and non-English) speaking patients looking for good chiropractic care in Japan. I've been a client of Dr Hojo's for a number of years and I've been delighted with his professional and friendly service. My Japanese skills are limited and it has been such a relief to receive regular excellent treatment and health advice in English. I recommend you try Dr Hojo's chiropractic clinic to help relieve your aches and pains. In 1895, D.D.palmer of the USA, discoverd the chiropractic manipulation techenique. Chiropractic is a health care of the skeltal structure system and especially nervous system for improving the health. We try to distinguish between acceptable and unacceptable serious problems that might be risk favotes for life, such as cancer, organ problems, heart problems etc. The purpose of chiropractic is to stimulate the body's natural healing system. The purpose is pulling out the self-treatment systems (homeostasis) as well as possible. In our opinion, chiropractic is much more than manipulations, selfcare (Posture, Exercise, Life style etc) is just as important. Treatment consists of both manipulation and guidance for continued self care. (Example) whiplash,low back pain, sprain, etc.